As you can do doubt surmise from the title, Alien 2: On Earth is designed to make you think that somehow the sequel to a hugely popular science-fiction horror film that came out only ten months prior was somehow given to an Italian production company to make as cheaply as possible. Like a lot of Italian films with questionable titling, the actual movie itself bares little more than a surface resemblance to the one it is stealing its imagery and name from, and in fact manages to forge an identity of its own. A manned space mission is returning to earth and there is a lot of anticipation about the astronaut’s splash down, but TV psychic and caving enthusiast, Thelma (Belinda Mayne), has a premonition that something horrible is going to happen. Then she leaves her TV show to go hang out with some friends in a cave, because you know… imminent doom, whatever. People begin to find strange blue rocks littering the ground, including one unfortunate little girl and Thelma’s friend, Burt (Mychael Shaw). The blue rock is actually an egg (or maybe the monster just looks like a rock when it's little? The movie is a little vague on this point). Either way, the alien starts eating heads and getting bigger, before chasing Thelma out of the caves and into a strangely barren city. Alien 2 exists to deliver exactly two things: cave scenery and gore. In this regard it performs very well. The scenes underground look to have been shot in the Carlsbad Caverns, which adds a beautiful eerie atmosphere to scenes that would have just been pointless slogging around if they had been shot in a studio. Just as often the cave scenes are an under lit mess that renders everything a brownish blob. The gore delivers quantity but not really much in the way of quality. Faces are eaten, heads removed, chests burst open, but I would hesitate to call any of it convincing. Anyone expecting to see some interesting alien design is out of luck as well, the alien is mostly relegated to POV shots and extreme close-ups of its mouth. Alien 2 takes far too long to get to mayhem; the viewer is forced to sit through a solid hour or so of wacky characters and attempts at dynamic shots of people climbing ropes. Really the film could have just begun in the cave; the astronaut story is dropped almost immediately and is extraneous at best. Because none of its individual parts work very well, there is something undeniably charming about Alien 2: On Earth. I appreciate its earnest seriousness when it tries to deliver aliens and psychic powers. I like the idea that the creators thought that featuring a climax set in a bowling alley was a good idea. We end up with the core of a horror film that is wrapped up in a bizarre shell of ineptitude, low budget, and honest-to-goodness weirdness. 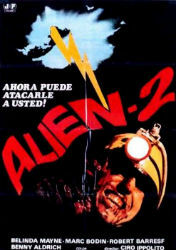 This might not be the best film to start on, if you’re new to 80’s era Italian genre films, but if you already have a taste for them, Alien 2: On Earth is a minor yet enjoyable entry.